ProAc Response D48 / D48R Loudspeakers - The Response D40 has successfully been in production for nearly 4 years, but with new driver technology now available to ProAc the decision was made to upgrade this model to the D48 available in both ribbon and soft dome mode. The D48 comes with an all new bass / mid driver with a special modified cone made from carbon fibre and pulp. This driver has all the attributes of being stiff, light and impregnated with pulp to damp out any resonances associated with thin stiff material. The new cone brings unrivalled midrange, being richer and more natural, negating the use of a midrange unit. The new cone also has a very tight extended bass response. The new carbon fibre pulp cone is made from impregnated carbon fibre pulp, the cone is terminated with a unique new roll surround giving the cone a very linear extended throw, important for bass extension. 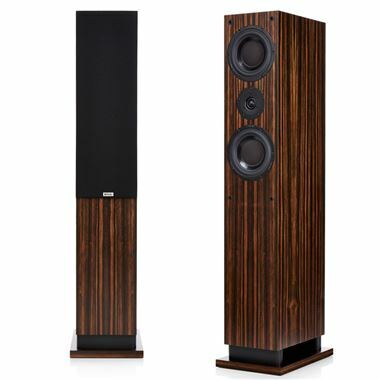 The new D48 utilises 2 new 6.5 carbon fibre pulp full range units achieving a powerful and extended bass, plus a new rich and detailed mid-range. These bass drivers are loaded through an equalised vent to air under the speaker and then side vented using 2 side bars to couple to the room.